There’s a very fine line between a film that’s self-aware and a parody. Often, a self-aware movie is one that ascribes to the tropes of a particular genre but does so with a tongue-in-cheek knowing wink. Parodies are usually films that play off the success of another film (or series/franchise of films) to make fun of the little foibles that make the referenced film so successful. In terms of straight comedy, these movies rely on previous knowledge of source material endemic to the popular culture surrounding it. 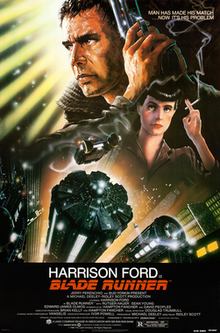 Consequently, while parodies are seen as “lower” comedy, and are rarely taken seriously (for obvious reasons), by piggybacking on a pop culture phenomenon, some of these parodies are almost as well-known as the movies they’re parodying. This week’s two films examine some successes from the golden age of parody: the 1980s. Despite acts like Abbot and Costello and The Marx Brothers being some of the trailblazers of parodies, the sub-genre of comedy didn’t really take off until the late 1970s and early 1980s. Part of this stemmed from the box office successes of big-budget action films, which themselves were ripe for parody. No genre, film, or franchise is safe from parody. Documentaries were parodied in This is Spinal Tap (1984), Frankenstein (1931) was parodied in Young Frankenstein (1974), and the James Bond franchise was parodied by the Austin Powers franchise. Of course, one of the kings of film parodies is none other than Mel Brooks. 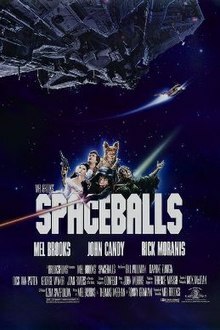 He parodied Broadway musicals in The Producers (1968), westerns in Blazing Saddles (1974), and the epitome of the space opera, Star Wars (1977), in Spaceballs (1987). Planet Spaceball is in trouble! They’ve run out of fresh air, and now President Skroob (Mel Brooks) is trying to figure out how to steal the clean air from nearby planet Druidia. By holding Princess Vespa (Daphne Zuniga) hostage, Skroob believes he can get the access codes for Druidia’s atmosphere shield. Before Dark Helmet (Rick Moranis) can arrive to kidnap the princess, she runs away from home, causing her father to hire the mercenary Lone Starr (Bill Pullman) to pursue her. While Lone Starr gets to Vespa first, his spacecraft runs out of fuel, causing them to crash land on a desert planet. While Lone Starr comes across a sage known as Yogurt (Mel Brooks) and learns about “The Schwartz,” Vespa is finally captured by Dark Helmet. It’s then up to Lone Starr to chase after Dark Helmet and use his newly acquired Schwarz powers to save the day. Sometimes parodies don’t necessarily poke fun at a single popular film. Sometimes these parodies cover many films within a genre. Sure, with as many Dracula films as there are, you’d expect to see a Mel Brooks film like Dracula: Dead and Loving It (1995). But for each of these films, you’d have parodies for high box office grossing films like Top Gun (1986) that was parodied in Hot Shots! (1991). However, with no Top Gun sequel, the Hot Shots! sequel (Part Deux (1993)) had to resort to parodying war films in general. Likewise, the Naked Gun series was a spinoff of the Police Squad! parodies of the “cop drama” genre. Even animated films are not immune, as shown by the parody that is Shrek (2001). And yet, in the 1970s, the “disaster” genre really took off, thus providing plenty of fuel for the cult classic that is Airplane! (1980). On a flight from Los Angeles to Chicago, an in-flight meal causes the flight crew and many of the passengers to become ill due to food poisoning. With nobody to fly the plane, flight attendant Elaine Dickinson (Julie Hagerty) contacts the control tower in Chicago, where she learns that the inflatable autopilot should get them to Chicago, but is unable to land the plane. Fortunately, Elaine’s former boyfriend, Ted Striker (Robert Hays), is a former fighter pilot and is also one of the passengers on the plane. Unfortunately, he has PTSD from his military service and has developed a “drinking problem,” as well as an aversion to flying, as a result. It’s now up to Ted’s former commanding officer, Rex Kramer (Robert Stack), to help him land the plane safely at Chicago. While the introduction of his former commanding officer causes some PTSD for Ted, the weather also creates a wrinkle in the landing. Will Ted safely land? For a director who has only directed six films in his career, George Lucas is one of the most recognizable names in the industry. Of course, this is also partly because his film studio, Lucasfilm, is responsible for the Star Wars and Indiana Jones franchises. When the main draw of a movie is the visuals and sounds involved with immersing the viewer in the world of the film, it’s no wonder that Industrial Light & Magic and Skywalker Sound are the great workhorses of Lucasfilm. What is almost ironic about George Lucas’ career is that, while he has written more films than he has directed, many actors and fans find the dialogue in these films to be clunky at best. Love him or hate him, George Lucas has made an indelible mark on film and on pop culture. This week’s two films highlight some of the best products of George Lucas’ career. 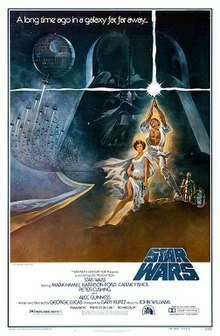 The film that launched a thousand starships, Star Wars (1977) was an amazing, technical feat we almost take for granted today. Most of the practical effects in this film, both on the ground and in space, have rarely been lived up to. While he didn’t direct The Empire Strikes Back (1980) or Return of the Jedi (1983), he did write each of them to maintain his vision of the Star Wars universe. George was back in the director’s chair for the prequel trilogy, writing and directing all three films in this less-than-exemplary follow-on to the cult hit he had created decades before. Despite not winning any Oscars from the original Star Wars, he was nominated for Best Director and Best Writing for his efforts. Strangely enough, both Harrison Ford and Alec Guinness did not like Lucas’ writing, especially for their dialogue. A long time ago in a galaxy far, far away, Princess Leia (Carrie Fisher) of the Rebel Alliance is trying to get the plans for the Death Star into her compatriots’ hands but is captured in the process. Fortunately, her droids manage to track down Obi-Wan Kenobi (Alec Guinness), who charters a spaceship to travel to Alderaan with his new compatriot, Luke Skywalker (Mark Hamill). Flying in the Millennium Falcon, piloted by Han Solo (Harrison Ford), the group arrive to find the planet destroyed by the Death Star. After being captured by the moon-like weapon, they manage to rescue the Princess and escape despite the loss of Kenobi at the hands of Darth Vader (David Prowse/James Earl Jones). Now that the Rebels know the weakness of the Death Star, they launch an assault on the weapon to destroy it for good. It’s almost odd to think that the man who brought the world Star Wars was the same one who also wrote and directed American Graffiti (1973). Earning his first Best Director and Best Writing Oscar nominations for this film, American Graffiti was George Lucas’ breakout success, even if it wasn’t his first film. Distinctly different in genre and tone from his very first film, THX 1138 (1971), American Graffiti examined a coming-of-age story set in a time of transition between high school and college. Perhaps due to its relatability to anyone who has ever been a teenager, this film has managed to place as high as #62 on the American Film Institute’s Top 100 movies list. 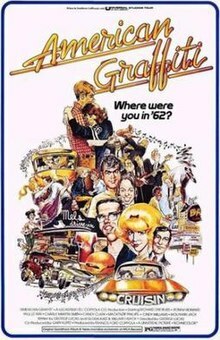 Unfortunately, the sequel, More American Graffiti (1979) failed to live up to its original, much like the Star Wars prequels would in years to come. After graduating high school earlier that year, a group of teens set out to have one last “hurrah” on the final day of summer vacation. Each of them has different destinations and dreams, many of them revolving around attending college in the next few days. In their last moments together before continuing their life elsewhere, these teens set out to drive around their hometown of Modesto, California looking for a good time. While some of them find missed opportunities, others take risks that have life-changing effects on their future plans. Each one of them realizes their childhood will soon be over, so they do the best they can to live it up in those final moments before flying away to attend college, get a job, or go to war. In the end, many of their decisions are based on love, which makes for a series of challenging goodbyes. When it comes to acting, the Shakespearian actor is often seen as the epitome of the profession. Being able to bring the Bard’s work to life on the stage requires a vast amount of skill and talent if it is to be done correctly. While many of these actors will remain in this highest form of thespian art, some take their skills to other mediums. Of course, because of this Shakespearian background, many of these actors who do start to perform in movies are quite selective about the films they decide to make. Often, they will stick to Shakespearian adaptations, since that’s mostly what they already know. But sometimes, the allure of a nice, big paycheck can get these actors to perform in pieces they do not fully endorse. This week’s two films highlight some moments from Shakespearian actor Alec Guinness’ career. Alec Guinness’ acting talent is undeniable, which is at least in part due to his regular collaboration with director David Lean. Even with supporting roles in films like Great Expectations (1946), Oliver Twist (1948), Lawrence of Arabia (1962), Doctor Zhivago (1965), and A Passage to India (1984), the combination of the British actor and British director worked well. They would both would win an Academy Award for Best Director and Actor, respectively, for their work on The Bridge on the River Kwai (1958). Of course, this was only five years after Guinness was nominated for Best Actor for his work in The Lavender Hill Mob (1951). He even won an honorary Oscar in 1980 “For advancing the art of screen acting through a host of memorable and distinguished performances.” While he would be nominated for Best Supporting Actor twice in his career, he really made his mark in his supporting roles like in Doctor Zhivago. Years after the Russian Revolution that brought communism into power, General Yevgraf Zhivago (Alec Guinness) is using his military connections to find his niece, the daughter of his half-brother, Yuri Zhivago (Omar Sharif). When he finds a young woman he believes to fit the description, he tells her of her parents’ lives. While Yevgraf was always a military man, Yuri was a poet in the body of a doctor. Through the events of an attack on a peaceful demonstration, Yuri first meets Lara (Julie Christie). When World War I arrives, Yevgraf is sent to fight while Yuri and Lara work for the army as doctor and nurse, respectively, and fall in love. After wars and revolutions pass, Yevgraf now works for the communist military and warns Yuri that his poetry is now condemned by the new regime. After getting Yuri to safety, Yevgraf finds that his half-brother’s poetry affected many people, albeit years later. Do actors have regrets? Sure they do, and Alec Guinness is no different. While he praised the special effects and technical aspects of Star Wars (1977), he absolutely hated the dialogue (amongst other factors). Even though the film netted him his first Best Supporting Actor nomination, Guinness loathed that it was essentially the only film most people knew him from. Because of his hesitations, he was quite the shrewd businessman and managed to get a sizeable payday and a good chunk of the royalties for his work on the film. Always the professional actor, he did the part and interacted with everyone involved courteously, despite regretting the attention he received after the films entered into the realm of “fandom.” In fact, Guinness himself wanted his character killed off in the first film so he wouldn’t have to play him as much in the later parts of the franchise. Obi-Wan Kenobi (Alec Guinness) is an old hermit who lives in the remote areas of the desert planet Tatooine. One day, he finds a familiar droid by the name of R2-D2 and learns that the Rebel Alliance, led by Princess Leia (Carrie Fisher), needs his help to get the plans of a devastating weapon to their headquarters on Alderaan. Deciding to comply with Leia’s request, he also enlists the help of Luke Skywalker (Mark Hamill), who initially found R2-D2 and is the son of his former protégé, Darth Vader (David Prowse/James Earl Jones). Upon chartering a ride to Alderaan on the Millennium Falcon, the sudden disappearance of the planet causes them to be captured by the Galactic Empire on the Death Star. Kenobi allows the Falcon to escape, but at the cost of his life. Now that the Rebels have the Death Star plans, Luke sets out to assist them in destroying the moon-sized weapon. When does an actor become recognizable? Is it when they are cast in a series of films beloved by their respective fandoms? Is it when they have an award-winning performance? Is it when they have appeared in enough films that they just “become known”? It seems the convergence of two or more of these factors are what usually thrust an actor across the threshold of being an “unknown” to being a recognizable name in Hollywood. Whatever the specific reason, Ewan McGregor is a recognizable actor today. Maybe it was from his role as Obi-Wan Kenobi in the Star Wars prequel trilogy? Maybe it was from being in an Oscar-nominated film or two? Maybe it was from the long list of acting credits to his name. This week’s two films highlight some of the roles that made Ewan McGregor a recognizable actor. In the world of film, sometimes acting isn’t enough. The most versatile actors can sing and dance, but these skills can likely be taught so that an actor can fill the role they were meant to play. For Ewan McGregor, he clearly has a recognizable voice, as shown by a few animated films that utilized his voice acting talent. 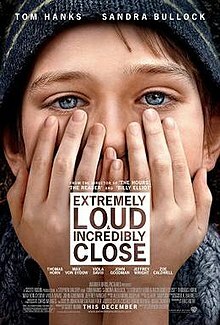 Robots (2005) and Valiant (2005) put McGregor in the lead role for their respective films, but this was at least four years after he truly proved his vocal prowess. There have been quite a few films (and even films about these types of films) where an actor or actress has their singing voice dubbed over (West Side Story (1961) being a prime example of this). In Moulin Rouge! (2001), it is clear the actors are using their own voices to sing. McGregor’s distinctive voice would definitely present a challenge to be dubbed over, that much is certain. A cross between love at first sight and a case of mistaken identities, Christian (Ewan McGregor) finds himself smitten with Satine (Nicole Kidman), the star of the Moulin Rouge. The confusion came when Christian was at the dance hall to pitch an idea for his theatre friends and Satine thought he was the mysterious Duke of Monroth (Richard Roxburgh). Unfortunately, once the air was cleared, the damage was already done. Christian and Satine fall in love, but now the financial future of the Moulin Rouge is in jeopardy, seeing as the Duke wants Satine for himself if he is to provide his patronage to the dance hall. On the surface, Satine agrees to this, but only on the condition that Christian’s play is performed. But what Christian and the Duke don’t know is that Satine is dying from tuberculosis, a disease made worse by her singing in the play. Years before Ewan McGregor did his best Alec Guinness impression in Star Wars: Episode I – The Phantom Menace (1999), he showed that he had the physical dedication to his roles in Trainspotting (1996). Obviously, the type of body training needed for action films like Star Wars and The Island (2005) is different than losing a lot of weight to play a heroin addict, but the commitment is still the same. And while Trainspotting definitely had its trippy moments, much like Big Fish (2003) would later in McGregor’s career; it was still delightfully dark with its comedy. We’ve seen McGregor come back to the dark comedy with I Love You Phillip Morris (2009) and The Men Who Stare at Goats (2009), but I, for one, am curious if this year’s Trainspotting 2 (2017) will continue the unique look at drugs that its predecessor did 20 years ago. Mark Renton (Ewan McGregor) is just one of a group of heroin addicts who have become friends. Of his own volition, he decides to go off of heroin, but does so via opium in an incident that takes place in “the worst toilet in Scotland.” Once the withdrawal ends, he hooks up with a girl who happened to be underage, thus pushing him back into heroin. 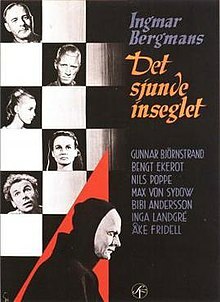 In this daze, Renton and his friends end up killing the infant daughter of Allison (Susan Vidler) through sheer neglect. While the rest of the crew gets in trouble for shoplifting, Renton is pardoned with the caveat that he has to get clean. Unfortunately, this causes him to overdose, and his family locks him in his childhood room to endure the withdrawal symptoms, including hallucinations. Now that he’s on the road to recovery, the gang wants to get back together for one last drug deal that could net them a lot of money. Renton obliges but ends up having the last laugh. Perhaps the most-used cliché in Hollywood, the Underdog never ceases to attract audiences. Why is this? I think the reason behind the popularity of an Underdog story is due to its relatability. Most underdogs are unequipped to challenge the more-skilled favorites of a competition. The Underdog always has some sort of “too” associated with them that prevents them from coming up against a fair fight: too young, too old, too weak, too poor. Despite these disadvantages, they still manage to stand up and take their opponents head-on. All too often, we are reminded of our shortcomings. We are reminded of the strengths of others. We all want the Underdog to win because we are the Underdog. We are inspired to overcome our circumstances as long as we see that it can be done. This week’s two films focus on Underdogs. A surprising amount of sports films focus on the Underdog. In fact, I’d almost wager they all do. Usually, the team with the greatest odds to win is the team with the most money, the most skill, the most talent, and the most black uniforms. And yet, even with all these factors in their favor, this team will not win at the end of the film. Sure, they’ll beat the Underdog the first time they cross paths, but this just gives the Underdog’s victory that much more of an impact. Many boxing films have featured Underdogs, including Million Dollar Baby (2004) with a woman who was too old, Cinderella Man (2005) with a man who was too poor, and Battling Butler (1926) with a man who was too weak. While the latter of this list is the most comedic of the set (and thus, the odd man out), the best-known Underdog boxer is that of Rocky Balboa from the 1976 Best Picture, Rocky. This classic Underdog story is a staple of the American Film Institute’s Top 100 list, currently placed at #57. Heavyweight champion Apollo Creed (Carl Weathers) is looking forward to the World Heavyweight Championship bout set to take place during New Year’s Day on America’s Bicentennial. Unfortunately, the contender has to bow out due to an injured hand, giving Creed a conundrum: nobody else has enough time to train for the match. As a result, he has an idea: let an unknown boxer, an Underdog, fight him instead. Enter Rocky Balboa (Sylvester Stallone): a nobody who is nicknamed “The Italian Stallion.” Rocky doesn’t think he can beat Creed but still wants to give it his all. He wants to “go the distance” with Creed because nobody else has. When the fight starts, nobody could expect Balboa to last to the final round, but he does, refusing to be knocked out. 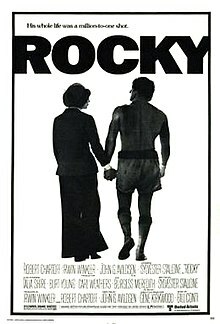 Even though he technically lost, the simple act of just hanging on made Rocky the winner of the film. The sports genre hasn’t completely cornered the market on Underdogs. Fantasy and science fiction often feature the Underdog, which perhaps explains a little bit about their fan-base. Frodo from The Lord of the Rings (2001-2003) was not the best candidate to destroy the ring of power. Katniss Everdeen from The Hunger Games (2012-2015) was from the weakest and poorest District. The Rebels from Star Wars (1977-1983) were too insignificant to defeat the Empire. And yet, all of these characters, amongst many others, all overcame their perceived weaknesses and managed to accomplish their goals, even against the overwhelming forces pitted against them. Of course, sometimes genres can cross boundaries. Science fiction is rife with robots and Underdogs. Sports films have boxers and Underdogs. 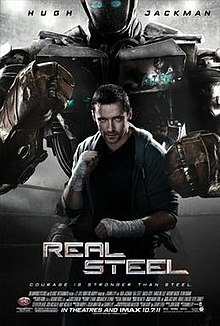 By combining these two genres at their common points, we arrive at Real Steel (2011).